The area where the capital is today has traditionally been the land of the Bari, a Nilotic ethnic group with a long history of inhabiting the svanna along the river. The name Juba comes from the name of a small Bari village that used to exist in this area before the city of Juba was established. In the 1800s, Gondokoro, a trading post and Christiann mission, was set up roughly ten miles to the north of the Juba village. As the southernmost outpost of the Egyptian garrison, Gondokoro was supported by a handful of soldiers. Contemporary accounts from Gondokoro show that it was heavily plagued by malaria, often evolving into blackwater fever. Several notable European explorers and campaigners used Gondokoro as a base, such as Samuel and Florence Baker who explored (what is today) South Sudan and northern Uganda in the 1860s and 1870s. By the early 1920s, the Church Missionary Society (CMS) was present in the area, running both a mission and the Nugent Memorial Intermediate School. During that same decade, Anglo-Egyptian officials ordered the Bari people to move away to give room for the creation of a town that was to serve as the capital of the Mongalla Province. Major construction work was started in Juba in 1927, and two years later traders from nearby Rejaf relocated into the new town that was about to be formed. At this point in history, the British Army in the region was heavily dependent on goods provided by Greek merchants, who in general also had a good relationship with the Bari. The Juba suburb that we today know as Hai Jalaba was referred to as the Greek Quarters back then, since so many people of Greek origin lived there. The Greeks were behind the construction of many of Juba’s early large buildings, especially in the area that is today known as the Juba Market district. The Ivory Bank, Nile Commercial Bank, Buffalo Bank, and Notos Lounge are some notable examples. In 1939, the Mongalla Governor’s office moved to Juba town. In 1947, the Juba Conference resulted in an agreement to unify northern and southern Sudan, very much against the wishes of the British who had hoped to join suthern Sudan with Uganda instead. Back then, Juba was still part of the Anglo-Egyptian Sudan, jointly administered by the United Kingdom and Egypt. During the Second Suadense Civil War, Juba was the focus of much war violence due to its strategic location and importance. This civil war started in 1983 and ended in 2005. In 2005, Juba became the interim seat and capital of the Autonomous Government of Southern Sudan. After the signing of the Comprehensive Peace Agreement, the United Nations increased its presence in Juba. (Before this, Kenya had been used as a base for many of the UN operations in southern Sudan.) 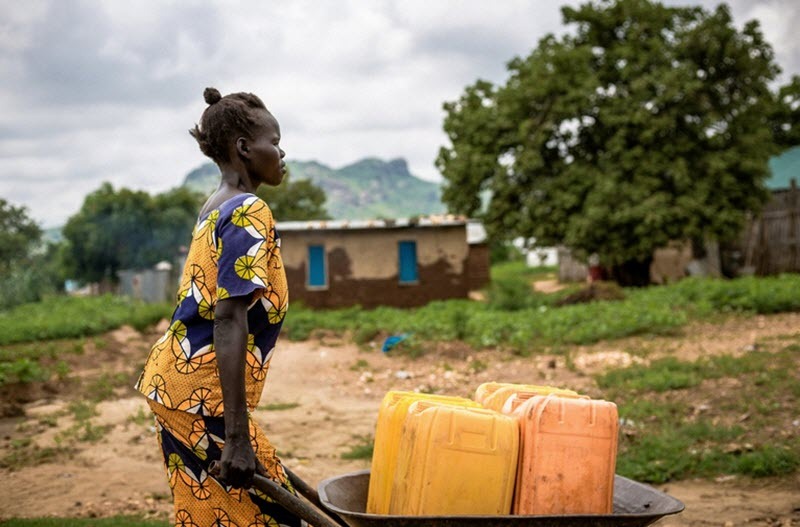 Among other things, the UN established the OCHA Camp in Juba, which served as a base for both UN operations and certain non-governmental organizations. On the 9th of July 2011, South Sudan formally declared its independence from the Republic of Sudan and announced that Juba would be the capital of the new country. Since then, the South Sudan government has expressed dissatisfaction with Juba and proposed the creation of a planned city that would take over as capital in the future. The most likely candidate for this is Ramciel in the state Lakes, since it is located in the geographical centre of South Sudan and is very close to the point where the borders of Central Equatoria, Jonglei and Lakes touch. Ramciel is roughly 250 km north of Juba.